Do you remember watching TV before the existence of live, on-the-scene newscasts? This author doesn’t, anymore than teenagers remember communications before the Internet. In the U.S., early remote Satellite News Gathering (SNG) from the late 1970s required large trucks with huge 2.4 to 5.0 meter C-band (4 to 8 GHz) reflectors (or dishes, as they were sometimes referred to) to transmit analog audio and video back to a studio for broadcasting. Because these lower frequencies interfere with microwave links, the FCC required a site survey prior to each transmission from a mobile SNG truck. The uplink vehicles typically required a dedicated and highly trained crew to complete the site setup and lots of power to operate the systems and cooling equipment. The full transponder bandwidth requirement to uplink was quite costly and that meant that the uplinks were not often used. Those early days of expensive uplinks were reserved for major planned events, such as political conventions, elections and major sporting events. Later, in the early 1980s, along came satellites with transponders in Ku-band (12 to 18 GHz), which continue to remain prevalent today. The higher frequencies did not interfere with microwave ground equipment — FCC site surveys were no longer required and reflector aperture size could be smaller. Many broadcasters moved to antennas typically sized at 1.2 meters and the FCC created the term VSAT to designate Very Small Aperture Terminal for antennas ranging in size from 75 centimeters to 1.2 meters. During this time period, digital compression technology arrived and completely changed everything. Equipment costs were still expensive; however, by the early 1990s, the overall costs per uplink were lower because compressed digital used only a quarter of a transponder — plus no site coordination was needed and “live on the scene” broadcasts began to spread and normalize. As news media outlets competed to be first on the scene, they became dependent on their satellite trucks to quickly provide reliable uplinks. Through most of the 1980s, antenna performance was lightly regulated in the U.S. There were few issues as GEO satellites were originally spaced 4 degrees apart to protect against causing adjacent satellite interference for transmitting Earth station antennas. However, as many new Ku-band satellites went into service — and they could be spaced at 2 degrees apart — and the number of Ku-band satellite uplink vehicles grew, adjacent satellite interference became a significant issue. The main causes of adjacent satellite interference originating from VSAT antennas are excessive side lobe radiation due to multiple factors that include poor antenna design and manufacturing or overpowering the transmit amplifier. The FCC promptly tightened regulations and required that off-axis energy for transmitting antennas be reduced by 50 percent and the agency mandated using off-set antennas with minimum blockage to meet the new specification. Accurate pointing of the main beam is essential to minimize or eliminate adjacent satellite interference, but misaligned cross polarization is a source of inference on the target satellite. Most Ku-band satellites transmit and receive using linear polarization, and cross polarization interference can occur between users when operating on the same frequencies in opposite poles, either vertical or horizontal. If each of the linear transmission signal waves has not been properly tuned to opposite phase alignment, then one signal can leak into the other. Cross polarization tuning is usually conducted between the satellite operator and the VSAT operator to eliminate this type of interference. Automating optimized cross polarization alignment was introduced by AvL Technologies in 2008, and today, sophisticated modem protocols require communication between the antenna controller and the Earth station at the NOC or network operations center. Modern digital satellite modems with modern auto-acquire antennas, such as those produced by AvL Technologies, will perform auto-cross-polarization and auto-power uplink control without user intervention. Returning to those late 1980s through 1990s when U.S. journalists were using satellite communications to broadcast live on the scene, covering events in local markets and major markets was relatively easy using SNG trucks. However, when international events had to be covered, news stations could not easily ship their trucks to the event site — an example of this is when it took three days to move an SNG truck to Mexico City to cover the earthquake of 1985. Broadcasters needed an antenna that could be packed into transit cases and then flown to any location in order to bring news directly to the media outlets in America. To build such an antenna terminal required segmenting the reflector into multiple pieces for packing into small cases. The individual reflector pieces had to be constructed from lightweight, yet extremely strong, materials. The reflector had to be able to withstand repeated assembly and disassembly without tools, all the while maintaining a highly accurate reflective surface to comply with adjacent satellite interference and cross-polarization specifications that have been discussed earlier in this article. This was a puzzling problem at the time because nothing like this existed in the U.S. Meanwhile, in the UK, a small company called Advent was using a material more common to Formula 1 racing at the time — carbon fiber composite — to build the world’s first manually pointed flyaway VSAT with a 1.9 meter aperture reflector. This was a wildly successful antenna design and the inventor was Steve McGuinness, the founder of Advent who has now been with AvL Technologies for 14 years. McGuinness received an Emmy award for Outstanding Technical Achievement and Engineering Development in Satellite News Gathering in 1993 for the development of that flyaway antenna. Jim Oliver founded AvL Technologies in 1994 after a friend requested that he design a compact, rugged and stiff antenna positioner for SNG trucks. Oliver was well-known in the industry as the co-founder of Satcom Technologies and as an innovative antenna designer. Within a few years, Oliver was building complete SNG antennas with 1.2, 1.5, 1.8 and 2.4 meter reflectors. By 2002, Oliver recognized the need for an auto-acquisition transportable antenna that could be operated by anyone — including volunteers — when he was contacted by the American Red Cross. During and after disasters, armies of Red Cross volunteers jump into action providing help and communications. Therefore, an auto-acquire transportable satellite antenna was absolutely necessary — and that antenna needed to be simple to operate. An AvL Model 9066 from 2006 with the auto acquisition green button. Oliver contacted another industry friend, Dave Provencher, who co-founded a small company called TracStar. Provencher had designed and built an antenna control system for digital video broadcasting, or DVB, receive-only antennas for the recreational vehicle industry, and Oliver had a concept for using DVB technology to obtain very accurate azimuth headings to locate satellites. Oliver and Provencher, along with TracStar CTO Chris Hadley, jointly developed a new DVB-based satellite locating method, which led to the first fully auto-acquisition antennas. This new auto-acquisition method worked extremely well and a mutually beneficial symbiotic relationship between AvL Technologies and TracStar was formed. Provencher later transitioned the ownership of TracStar to Cobham, then took a year off before joining AvL in 2015. Oliver did not stop with auto-acquire SNG and VSAT antennas. The terrorist attacks of September 11, 2001, and the resulting invasion of Iraq brought a need for high bandwidth communications built to withstand rugged and harsh environments and operated by non-technical war fighters. Oliver’s team, with Mike Proffitt at the helm of operations, quickly designed and built a 1.0 meter aperture reflector, segmented in four pieces, and a 2.0 meter antenna with nine segments, and outfitted both transportable positioners with a fully auto acquire TracStar controller. This design used carbon fiber composites similar to that of the flyaway antennas from Advent. 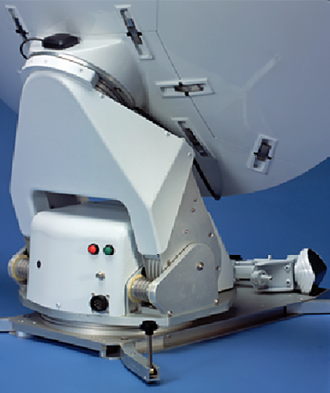 Every AvL antenna has always had a green and a red button and everyone in the company knows the phrase, “green button means go, red button means stow.” Both demonstrations in 2003 were successful and the orders soon flowed in from prime defense contractors needing easy-to-operate, robust communications (single to multiple T1 lines) in the Middle East by all of the DoD forces for tactical, logistics and intelligence activities. 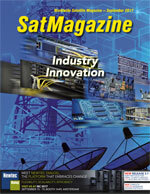 Recent years have brought satellite advancements in Ka-band (26.5 to 40 GHz) and new High Throughput Satellites, or HTS. 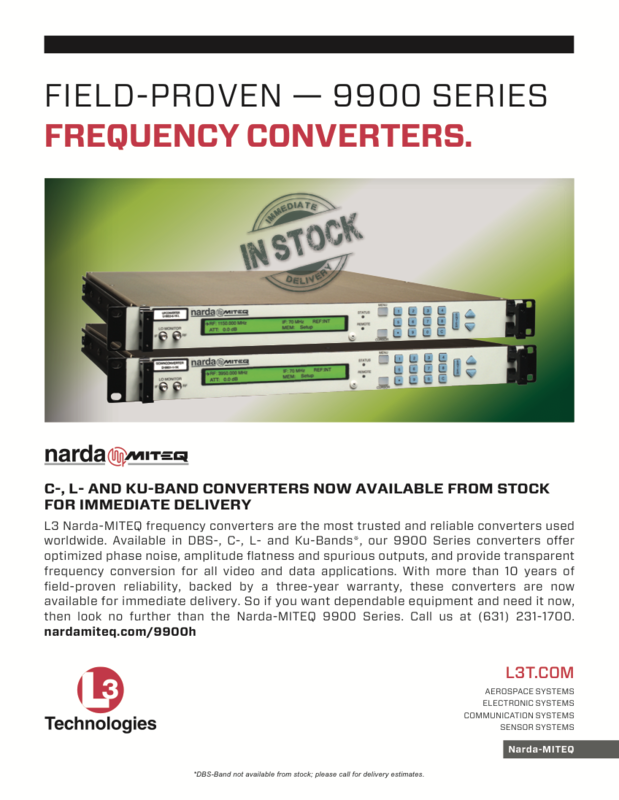 Ka-band HTS using spot beam technologies deliver much higher data rates than traditional Ku-band satellites but are more susceptible to degraded performance in rain, dense clouds or fog. Rain attenuation in this band can often be remedied with higher transmit power but this requires a more accurate reflector and higher precision pointing due to the narrow wavelengths of the much higher frequencies as compared to Ku-band. Today’s users of VSAT technologies are familiar with small and easily transportable antennas — either mounted to trucks or transported in small cases — as well as the simplicity of the green and red buttons that enable easy-to-use satellite communications on the go. However, VSATs have transformed and innovated over time — just as satellites and other segments of the industry have — and few remember the days when an engineer was required to point a large antenna. Thanks to innovators and industry pioneers such as Jim Oliver, Steve McGuinness and Dave Provencher, the industry has changed and the tools have greatly improved. These advancements have contributed to the proliferation of VSAT antennas atop the modern-day uplink van, which is easily supported by a crew of only two: the camera operator and the news journalist. 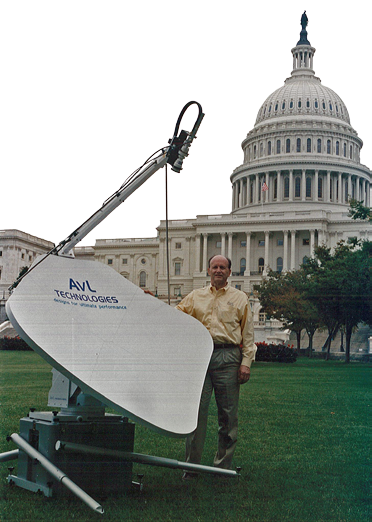 Editor’s note: The opening photo is of Jim Oliver at the U.S. Capitol Building with an early AvL flyaway antenna. Bryan Kerns is the Director of Strategic Business Development at AvL Technologies. Prior to joining AvL in 2010, Bryan was Director of Business Development at CapRock Government Solutions. He previously held roles at LBiSat, Verizon Business and the U.S. Air Force.